Like water spinning in a vortex, the lace patterns on these socks swirl dramatically around your legs. Moving in opposite directions as though you were straddling the Equator, Vortical’s biased lace patterns slant left and right, one for each leg. Worked from the top down in a yarn over stitch, the biased patterns are easy to remember and quick to knit. One of my test knitters said she didn’t get second sock syndrome because a different stitch is used on the left sock than the right. I’ve been thinking about dyeing a finished pair of socks, and knew Panda Cotton would be perfect for the project. But, I realized some knitters would rather knit the socks and be done. So I designed this project with the ever-popular Socks That Rock Super Wash Merino in a colorway that I couldn’t resist. Firebird is full of vibrant oranges, pinks, and purples that complement each other perfectly. So, I picked the same colors to dye the Panda Cotton socks, resulting in a similar colorway that is just brighter and more concentrated. These are some of the most comfortable socks I have ever worn. The dyeing process is interesting and quite a bit of fun. Whether you buy the colorway, make it, or both, you’ll thoroughly enjoy these socks. US#1 (2.25 mm): 32″ circular needle (for S/M size). US#2 (2.75 mm): 32″ circular needle (for M/L size). Switch needle size if necessary to get gauge. Size M/L: 26 sts and 48 rnds = 4″ in biased lace sts on US#2 when worked in the rnd. Size S/M: 32 sts and 56 rnds = 4″ in biased lace sts on US#1 when worked in the rnd. Jacquard Procion MX Dye #180 Peach, Jacquard Procion MX Dye #040 Fuchsia, Jacquard Procion MX Dye #042 Raspberry, Jacquard Procion MX Dye #020 Brilliant Orange, Jacquard Soda Ash Dye Fixer, Measuring cup and spoons, 8 small jars, rubber gloves, Synthrapol, dust mask, 8 craft sponge brushes, 8 gallon-size zip-lock plastic freezer bags, and plastic table cloth or tarp. Sizing: For women’s small/medium, get tighter gauge. To make a women’s medium/large, get looser gauge. Magic Loop: Vortical was knitted using the Magic Loop technique with one long circular needle. Magic Loop instructions can be found here. Magic Loop substitutes for both circular knitting on short cables and double-pointed needles. 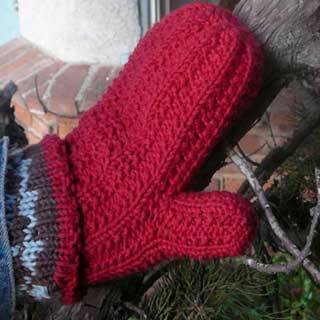 Using circular needles that have at least a 32″ cable or longer, cast on the desired number of stitches, divide them in half, and pull a length of cable out where they divide, sliding the yarn down to the tips of both needles. Hold the needles parallel to one another in front of you horizontally with working yarn on the needle in back. Pull out “back” needle, slipping the stitches onto the center of the cable (you now have two lengths of cable looping out in opposite directions). Bring the yarn around to the “front” needle and knit the first half of stitches with the working yarn. Turn needles to continue knitting with working yarn coming from “back” needle, making sure to pull out cable to maintain the two-loop configuration at all times. Work across both needles to complete each round. I recommend The Magic Loop by Bev Galeskas for more detailed instructions. 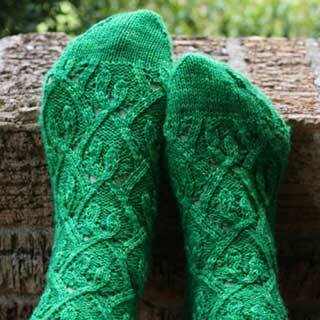 Vortical socks are worked in two biased lace patterns that spiral in opposite directions when worn. Lace is worked on leg and instep stitches only. Repeat Rnds 1 and 2. These lace patterns are biased. They will create a slanted fabric that spirals around the leg and across the top of the foot when unstretched. 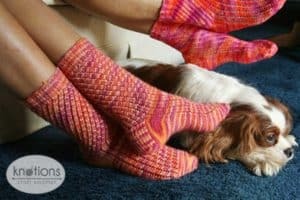 Soon after completing the heel gusset, the instep stitches will begin to twist sharply, making a funny-looking point on one side of the sock as you approach the toe. Don’t worry. It’s supposed to look like this. CO 60 sts and divide for Magic Loop – 30 sts on each needle. Join taking care not to twist. Work cuff in 2×2 Rib for 1.5”. Work leg in biased lace pattern for 4″ for shorter sock, 6″ for taller sock (be sure to switch to opposite lace pattern for second sock). Heel is worked back and forth on N1. Row 2: Sl1 purlwise, purl to end. Repeat 2 rows on N1 until 30 rows are worked. Work across 18 sts on N1. Pick up 15 sts along the side of the heel + 1 st in corner (16 total sts). Work across 30 sts on N2 in biased lace pattern. Pick up 1 st in corner + 15 sts along other side of heel (16 total sts). Work across heel sts and 16 side sts. To return all of the heel sts to N1, simply pull Magic Loop cord out after counting across 30 instep sts, leaving only instep sts on N2. Work across N2 in lace pattern. N1: K1, ssk, work to 3sts before end of N1, k2tog, k1. Work even across N1 (St st) and N2 (lace pattern). Work Gusset Rnds 1 and 2 until 60 sts rem. Continue working until foot measures 1.625″ less than desired foot length, ending after N2. N2: Repeat instructions for N1. Rnd 2: Work across all sts even in St st.
Work these 2 rnds until 28 sts rem. Work only Rnd 1 until 16 sts rem. Graft 16 toe sts using Kitchener stitch (see Pattern Notes). 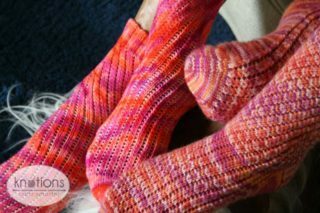 Be sure to use opposite biased lace pattern when knitting second sock. Weave in ends. Block socks before wearing. Both yarns may be machine washed, but I recommend you hand wash with mild detergent and air dry. Thanks to Anastasia Rynearson and Evelyn Rector for knitting the samples, and my mom, Beth Bess, for her pattern writing help. Phoenix’s patterns are sold through yarn stores, catalogues, and online, including her website, phoenixbess.com. She blogs about designing, knitting, and the challenges of being 16 at phoenixbess.wordpress.com. Her new book, It Girl Knits, debuted October 14th. Pattern and images © 2008 Phoenix Bess.